Not quite black but possibly the closest to it in a rose - this beauty will be admired by all in your garden. A 'Hybrid Tea' variety with large fragrant blooms - perfect for cutting. In bud, the flowers are the deepest chocolate maroon, lightening a little as the petals unfurl. Easy to care for and best in full sun. Supplied as 'Grade A' bare root bush with a minimum of 3 good stems. Plant as soon as possible after receipt. 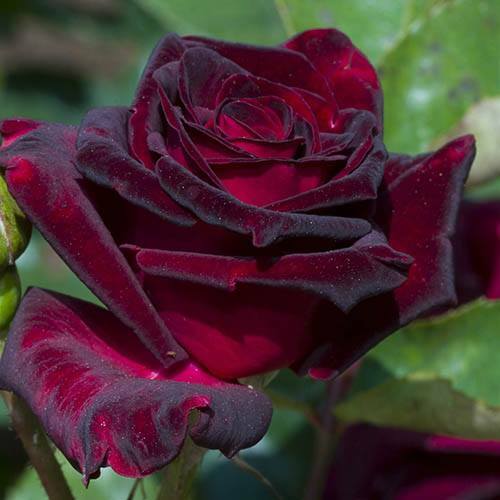 Not quite black but possibly the closest to it in a rose - this beauty will be admired by all in your garden with it’s sumptuous deep crimson-purple blooms. A 'Hybrid Tea' variety, it produces large, elegant, fragrant blooms in abundance all summer-long, from June right through to September. In bud, the flowers are the deepest chocolate maroon, which lightens as the petals unfurl, creating a real to-die-for classic rose. Borne on long strong stems, the blooms stand proud in the border and will also fill large patio containers. Originally only available to florists as cut flowers, now you can grow them in your own garden to cut and create your very own beautiful vase displays! Long-lasting, why not give a bunch to friends or family? Easy to care for and best in full sun. Like most roses prune in late winter cutting back hard to a bud as the flowers are borne on new growth that follows.